I went with friend Di Binns to the Artsource open studios in Midland today. We got there early so looked in on the Farmers’ Market first. Seeing this vegetable, I couldn’t resist buying it, if only for the photographic opportunity. I think the vendor said it was a “Cathedral Cabbage”. It doesn’t look like a cabbage; more like a cauliflower. I’ve googled both and not got a hit so who knows what it really is? 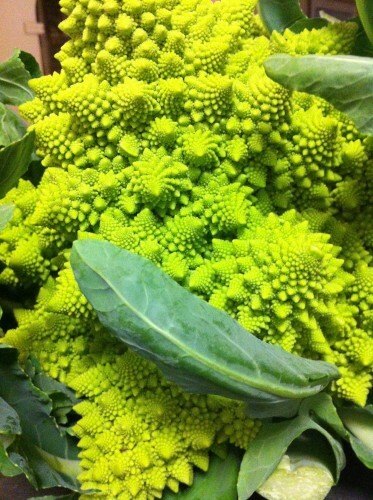 What colour and texture is in this vegetable!!! Apart from gorgeous. It’s so much more worthy of a place on this blog than anything else I’ve had anything to do with all week…. It is beautiful! It’s known in the uk as a romancesco cauliflower. Although the ‘net also refers to it as a broccoli. Def cauliflower IMHO. 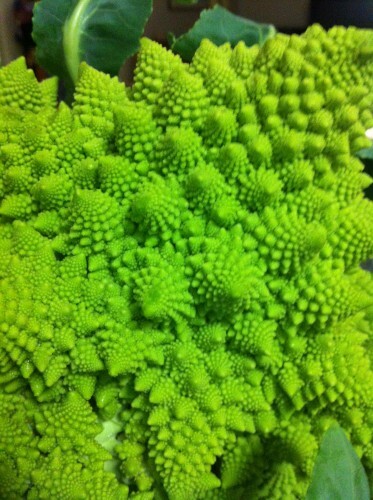 http://en.m.wikipedia.org/wiki/Romanesco_broccoli. Sorry I missed the studios. I forgot all about it after my landlord dropped the bomshell that they want to sell the house I’m renting!!!! Not good timing. Largelasses of wine consumed!! That’s dreadful Emma! I hope you have enough time to find another place? Whatever it is it’s stunning! One of the many amazing design sources nature provides. Have you eaten it yet? It does look gorgeous.